Well hello there! I am SO GLAD you that you've contacted me about your wedding photography. I absolutely adore photographing weddings and I am so excited to be involved in yours! I first started out in photography taking wonderfully underexposed photos of Barbie posed ever-so-elegantly in our driveway. I think I was seven. Maybe eight. Shortly thereafter we took a family trip to SeaWorld and my brother and I were given our parents' old SLR with strict instructions that we were to share it - to the extent of handing it over every other photo. Yeah...that didn't really happen. Let's just say I got a lot of photos of Shamu while Bob maybe got one of his cotton candy while I wasn't looking. After living in Jackson for a few years I went back to school to get my photo degree. Of course, I had no idea what I wanted to do with it, just that I wanted to learn everything I could about making pictures. When I graduated I came right back to Jackson with my fiancè in tow. We got married in 2006 and the second I saw our wedding photographs I knew THAT was what I wanted to do with all of my fancy pants photo knowledge. So I pestered our poor wedding photographer incessantly until he let me follow him on a few weddings. I practiced like crazy, and as soon as I had photographed my very first wedding I was completely hooked. I love weddings and I love photography. It's a good thing wedding photography exists or I'd be in big trouble, eh? I love silliness. 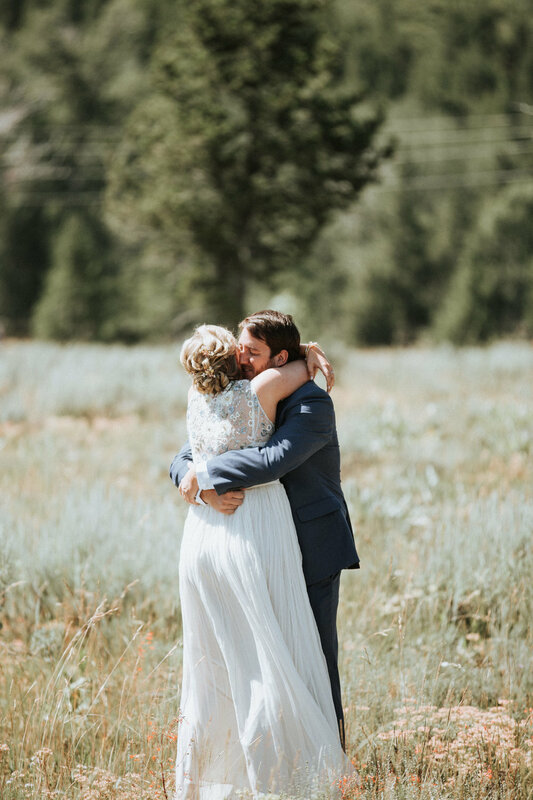 I love silliness and earnestness and emotions and family and friends and happy tears and ugly crying and laughter and joy and love and the way it all wraps up into one beautifully perfect day. I'm the photographer that will tell you to give me your serious face and then immediately start cracking jokes. Seriously, I can't help myself. I'll do it during your portrait session, just wait. I try not to do too many poses. I'll give you an idea of what I'd like and let you run with it. I like to wait and watch for those little moments when you completely forget I'm there and start realizing that you're REALLY, ACTUALLY, HONEST-TO-PETE MARRIED and get all squishy and noodly together. You'd be surprised what some noodliness will get you, photo-wise. It's all about the ninja. These collections are simply a starting point; please feel free to inquire about custom options for your day. **Elopement collections are available for groups of 10 or less and in the immediate Jackson area only. Is there something you're interested in that you don't see here? Let me know and let's get it worked out! Waaaaay back in the day of pre-arranged marriages - when marriage was a business deal between families - brides and grooms were never allowed to see (or even meet!) each other before the wedding. This was so the groom wouldn't have time to back out of the wedding if he happened to find the bride unattractive or unappealing. Charming, no? Over the years, the tradition of the "bride in hiding" changed into a superstition and seeing each other before the wedding was considered to be bad luck. Nowadays, though, this tradition is being kicked to the curb by modern brides and grooms everywhere. What's a first look? The two of you get ready separately, and once you're both looking your absolute best I'll take you to a pre-arranged spot. One of you will come up behind the other and it's seriously just about the most romantic thing ever. You two get some wonderful precious alone time (which is generally in short supply on your wedding day!) and I get some fabulous images of you seeing each other in all of your fanciness for the first time. We'll have more time for amazing, natural light portraits. If you wait until the ceremony to see each other, we'll be doing all of your portraits after the wedding. 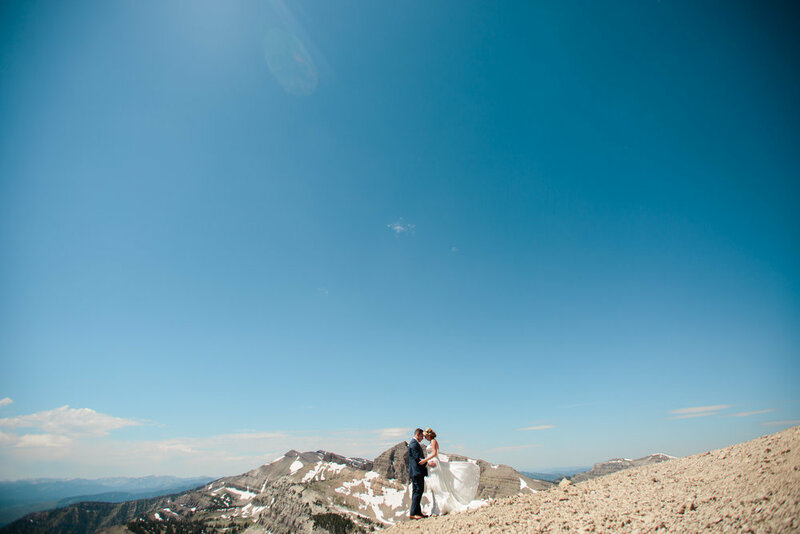 This is no problem if you're doing an afternoon ceremony, but if it will be dark after your ceremony our options for creative portraits with the gorgeous Teton scenery will be limited. Having an extra hour before the ceremony for wedding party and couple portraits when there is still plenty of sunlight makes for great photos! You'll also be able to get to your reception more quickly and greet your guests sooner - after the ceremony, most of your guests will head over to the reception area. You'll be excited and ready to go see everyone and not want to leave everyone waiting while you take pictures. I've been to enough weddings now that I know your coordinator will be pulling you towards the reception, your parents will be telling you to finish up already, and your wedding party will be ready to get to the party! Getting all the big group photos done before the ceremony when there is no rush and nobody waiting for you is 150% less stressful - I pinky promise. Q) Can I make prints with the files that are included in the basic package? A) Absolutely! All of the files are high resolution and ready to print up to about 11x16. You can print as many as you'd like, anywhere you like. Q) Can we put pictures on Facebook and Instagram? A) Yup! The only rule is that I'd love a photo credit when you do it - if you download the low-resolution set from your client site they'll be the perfect size for social media AND have my logo on them - WIN WIN. Q) Can I drop a few hours from my package to save some cash? A) You can drop hours, but it won't save you anything UNLESS you're getting married on a Friday or a Sunday. Saturdays are prime dates for me, so I very rarely accept bookings for less than six hours on Saturdays. 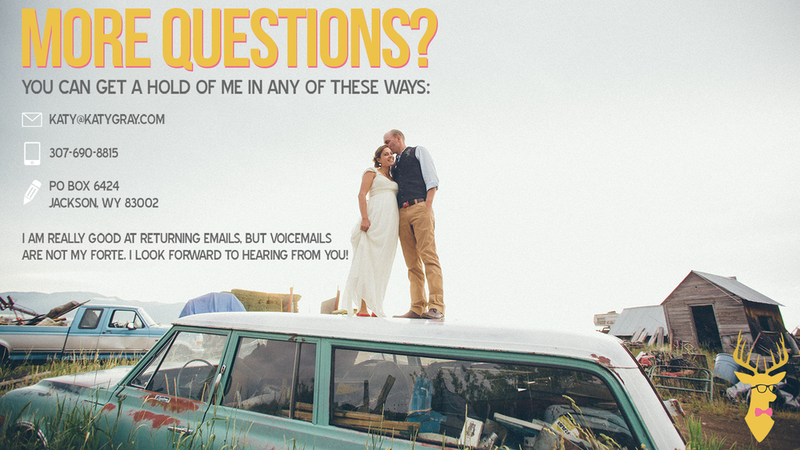 If you're getting married on an off peak day and are only looking for a few hours, email me for a custom quote specific to your wedding needs. Q) Do we have to add albums now or can we order them later? A) You can definitely order your album later! Whatever works best for you is fine by me. Albums included with a collection are discounted, so you do save some money if you include an album up front. Q) Do you mind if our family members take photos at the wedding and reception? A) Of course not - Aunt Suzie and Uncle Bob can snap away all they want. I will never tell your family to put their cameras away and their flashes won't bother me in the least. The only time I'll ask someone to move is if they are in the aisle during the ceremony and I can't get around them. Q) We have a break in between our ceremony and reception. Can we break up our hours? A) My collections include consecutive hours of coverage, which means even if there is a break, I'll only be on the clock for whatever amount of time you hired me for (generally between six and ten hours). If you need additional hours, let me know and we can get them added on to your package. Q) What if our reception runs later than we expected? Can you stay until the very end to capture our grand exit? A) Of course I can - just let me know that you'd like me to stay a bit longer! My overtime rate is the same as my a la carte rate for additional time and I can invoice you after the wedding. No proofs or social media will be posted until the overtime has been paid in full. Q) We definitely want to book you! What's the next step? A) Awesome! I am excited to work with you! To officially book me, both partners will need to sign the online contract and pay my retainer (about 1/3 of your collection price - the exact amount will be in your quote). Then you're on my calendar in permanent marker! Q) It might take us a couple of months to get the retainer saved up - can you pencil us in? A) Unfortunately no, I can't. The only way to reserve your date with me is to sign a contract and pay the retainer. Q) Do you accept credit cards? A) Darn tootin! If you'd prefer to send a check, my mailing address is: Katy Gray Photography, PO Box 6424, Jackson, WY 83002. A) Absolutely! I can even give you recommendations for my favorite online labs. A) Of course! I use an awesome professional lab that produces AMAZING prints. If you'd like to leave the printing up to me, just let me know. Q) What do you mean by high resolution proof files? Will they be edited? A) Yep! All the photos you receive will be color corrected and ready to print. They are NOT straight out of camera files. What you see in your gallery are the files you'll receive. A) Not exactly. What I have you is a license to print your photos, any where, any time. Katy Gray Photography retains copyright to all photos. Your license does not include permission to sell, modify, or enter your photos in any contests. Let me know if you have any other copyright questions!